First birthday are a big deal! We’ve compiled a list of the best 1st birthday parties in NY. Browse our guide to find one that is perfect for your family. KidsParties.Party also has an excellent guide to baby’s first birthday parties in New York. Celebrate Your Child’s First Birthday Party in New York at Frolic! Frolic has the very best planners for your child’s first birthday party in New York. There are several themes from which to choose, but their ultimate party for your one year old is the “It’s A First” party. Because this event is so special, they have thought of and planned out every detail for this once-in-a-lifetime celebration. Party packages start at $795 (this includes 10 children and 25 adults; there is an additional charge for extra guests.) There is no charge for the birthday child. Both Saturday and Sunday hours are available. For your child’s First Birthday Party in New York, Frolic’s facilities are perfect to accommodate large numbers of attendees. There is a fully staffed birthday party crew in attendance, a private/large party room with custom/themed décor with specialized party favors and balloons for each guest, food, and of course a personalized birthday cake (may substitute cupcakes upon request). Party add-ons are also available. Let one of Frolic’s party professionals help you with your child’s First Birthday Party! Look over your shoulder and you just might see Willy Wonka! No one could not fall in love with Dylan’s Candy Bar for a first birthday party in New York. If you are the birthday baby, guests thereof, or accompanying family/friends, you’ll experience one of the best days of your life. Dylan’s Candy Bar offers many birthday packages, but by far, one of their sweetest is their Sugar Babies First Birthday (also available for 2nd and 3rd birthdays.) This delicious package includes accommodations & party room for 20 guests (2 hours), dedicated staff of 4, Dylan’s signature invitations, decorations, balloons, paper supplies, food (pizza, salad, juice, soda, water), professional face painter or balloon artist, a candy spree, and of course, a birthday cake for your child's special day. Prices start at $2,500. Each additional guest is $75.00. Available hours are until 4:00 p.m. on Saturday and Sunday. There are additional times available for add-ons; contact one of their courteous staff members for additional info. The first year of your child’s life is so special; why not include yourself when thinking of the perfect venue to celebrate? After all, you have spent the first 12 months caring for your baby, this day is also to give yourself a pat on the back… And where better to celebrate your child’s first birthday in New York than Alice’s Tea Cup. This cozy setting is not only perfect for your baby, but for your family members who have helped and supported you during the months leading up to your child’s first birthday. Hours are Monday - Thursday (all hours); Friday - Sunday after 3:00 p.m., cost is $20/child. They offer so much at each one of their three locations, they are the best place for your child’s first birthday in New York! If you have children of different ages, a first birthday party may not be exciting enough for them; consider coming to the Brooklyn Children's Museum. For a first birthday party in New York, the museum welcomes all children with education and fun. The Brooklyn Children's Museum has experience in organizing birthday parties for children, ages one through ten. Their packages include museum admission for your birthday guests (on the day of the party), and one pass for each child to visit in the future! They offer 3 different packages: Fantasia Package: Up to 40 guests, a party room upgrade to the museum’s library, cake/food/ beverages for 30. Next is the Deluxe Package: Up to 25 guests in the Celebration room with cake/food and beverages for 20. The third choice is the Bargain Bash: Up to 20 guests, cake/milk for 20, with private space for your party. For a first birthday party in New York, The Brooklyn Children's Museum is a great choice. First Birthday Parties at Kidville are World Class! 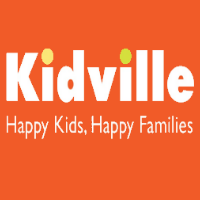 For a dazzling first birthday party in New York, Kidville is the best choice. Their experienced staff will help you plan the party, work out the details, and execute the special event on the day of the party. Prices start at $695 and include 90 minutes in the party zone with 10 guests plus the birthday child, personalized invitations, an online RSVP service, juice/pizza, premium party favors, balloons, decorations, paper goods, etc. And the best part of all is that you won't have to clean up. Kidville is one of those great businesses for helping you with a first birthday in New York that is so great your friends will ask you how you found them. The NY Kids Club has six venues in New York City, for a 1st Birthday Party in NY. If you are celebrating your child’s first birthday party in New York, you’ll want to call The NY Kids Club for this very special event. “My 1st Birthday Party” by NY Kids Club is one of their most popular themes. Their experienced and enthusiastic instructors will engage toddlers in an hour of gentle gym time activities. In addition, their caring staff members will begin the NY Kids Club’s sing-a-long, with original music, instruments, and props – all for a perfect day of entertainment. But the fun is not over yet! Before leaving the guests create a hand printed keepsake and enjoy a first birthday cake! Prices start at $650.00 for the basic package; times are from 12:30 p.m. - 2:00 p.m., 2:30 p.m. - 4:00 p.m., or 4:30 p.m. to 6:00 p.m. For a first birthday party in New York, NY Kids Club is the best!